The 2009 CORVETTE Order Guide is now online for you to download. Click Here for RPO Breakdown. What Happened to the Automotive Industry? The GM Heritage Collection numbers in the many hundreds of cars and trucks - from 'first builds'and 'last builds to one-off show cars to SEMA show cars. The Decision has been made to sell off select vehicles. Indeed, a sad day! There's a little of everything -- from the Legendary Buick Blackhawk -- to (are you sitting down?) a COUPLE of 1989 Corvette ZR1s -- the Jon Moss built Track-dominating Black 572 ZL1 -- A C5 Alpha and a C5 Beta -- The Tiger Shark -- the LT5 Camaro -- a 1904 Olds Touring -- several GTOS -- both old and new -- a couple of 1970 muscle cars -- a mid nineties "510", Impala SS -- and many, many pace cars and trucks. Barrett-Jackson will, in the coming week or two, put out pictures of each of these cars on their website. The auction is the Scottsdale, AZ auction -- January 13-19, 2009. Break our your Piggy Banks! TWO SPECIAL EDITION CORVETTES ARE SCHEDULED FOR EARLY 2009 ! Members, rumors have been flying for months that there will be a Special Edition Corvette coming out in early 2009. WELL, THEY ARE COMING ! The latest gossip focuses on NOT one, but two special editions for the Spring 2009 production time frame. One of them is believed to be a C6 “Racer Edition” with a very attractive price. Three different colors are rumored to be in the running for this C6 “Racer.” A very unique feature for this “Racer Edition” will be the inclusion of the European Differential Cooler coupled with the Z51Performance Handling Package. The other Special Edition will be a tribute to Corvette and the GT Racing Series. This Special Edition will be a LIMITED run available in two colors and will allow the purchaser to be able to equip it as they would like. What makes this so unique is that NO two (due to the limited numbers produced) may be alike based on how they are ordered and equipped. Members, we wish all of you a Happy Thanksgiving and a wonderful weekend with your family! There has been quite a bit of misinformation published about the Corvette Plant and its operation schedule. THE FACTS ARE: The Bowling Green Assembly Plant will be closed for the Thanksgiving break beginning Thursday, November 27th through Monday, December 8th. The Plant will reopen on Monday, December 8th and operate at normal schedule through Tuesday, December 23rd when it will close again for the Christmas Holiday break with a special extended break until Monday, January 19th, 2009. MOBIL 1 OIL AVAILABILITY RESTRICTED! Members, Your Corvette maintenance intervals could be affected by this news! On October 1, 2008, the Big Three Automakers were notified that due to Hurricane Ike and its effects on the Texas Gulf Coast, a negative impact on the production capacity of Mobil 1 has occurred. More job cuts at the Bowling Green Assembly Plant. The Corvette plant intends to layoff 110 workers in January and shut down production for two weeks while it cuts Corvette production from 15 to 11 vehicles an hour. The plant will also shut down its Cadillac XLR production during December, temporarily laying off about 30 employees who work on the XLR line. The layoffs in January affect both Corvette and Cadillac XLR production workers. The plant employs around 800 workers. We are told that plant officials informed employees of the cuts Friday morning. "Most of our employees knew that more changes would be made to our production schedule, based upon more recent sales figures," said Andrea Hales, communication director for the Bowling Green assembly plant. "I just don't know if they expected it to be as big of an impact as what we announced this morning." The January cuts top a list of gloomy announcements for GM workers this month. Officials announced last week plans to close the plant for a week in December to re-evaluate inventory and lessen production numbers for the month. That shutdown is still scheduled to occur, Hales said. About a month ago, the Bowling Green plant closed for a week to slice Corvette production from 18.5 to 15 vehicles an hour, a move that resulted in about 70 lost jobs. Plant officials plan to cut XLR production in 2009 but do not yet know details of the production cuts. 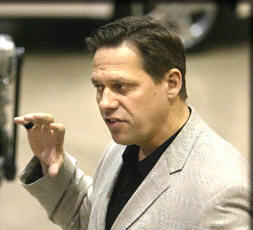 Officials also are not sure if the Corvette line will face further cuts next year, Hales said. "At this time, nothing is certain and we really just take it in stride and watch our sales figures, our sales results and the overall market," she said. Corvette sales took a nosedive in the past few months. Sales plummeted about 53 percent in October compared to sales through October last year. Cadillac XLR sales decreased 56 percent this year compared to sales through October 2007 last year. "Corvette sales, they were doing fairly well until the last few months," said Tom Wilkinson, spokesperson for General Motors. "A lot of luxury segments have been pretty heavily impacted." A lack of consumer confidence due to a dwindling economy is to blame for the sales plunge, he said. "The people who have the money are not spending it," he said. "And the people who don't have the money are having trouble getting credit." General Motors recently reported a $2.5 billion loss in its third quarter for this year. "Third quarter earnings in industry sales are very, very low right now," Wilkinson said. "By some measures, it's the worst industry (situation) since World War II." General Motores plans to lay off about 3,600 workers and slow production at 10 assembly plants early next year, according to reports. The Bowling Green plant will shut down the week of Jan. 5 and the week of Jan. 12, Hales said. "It's an unfortunate situation," Wilkinson said. "But sales are running at a very low pace, and nobody is sure when they are going to pick up." Automakers are requesting $25 billion in government funds for economic relief, according to reports. The Energy Department has taken steps to offer $25 billion for the production of fuel-efficient vehicles, but automakers are lobbying the government for more loans to help repair the wounded automobile market, reports say. "The U.S. government's actions to help stabilize the credit markets and eventually ease the credit crunch are an essential first step to the economy's and the auto industry's recovery," GM CEO Rick Wagoner said in a news release. "But further strong action is required." Wilkinson said government-backed loans are critical "to get through the next year or so. We think the auto industry is absolutely worth supporting." Still, GM officials believe the market will improve, and they are determined to keep the company afloat "so we're around to see that happen," Wilkinson said. "Production cuts are difficult, but we need to keep the company viable," he said. "And we think the Corvette will definitely take off again." And while doses of uncertainty and fear haunt those at the Bowling Green plant, workers are still holding onto hope. "Our employees are hopeful that we will see a turnaround," Hales said. "If the market improves and we gain consumer confidence back, then we're here to build more Corvettes." On Thursday, November 6th the Corvette Racing team ran the two 2008 C6.R's at Sebring, doing the final day of a three day Pratt & Miller test. Both of the cars still had the paint and decals from the last two ALM races. It was reported by onlookers number 3 was running in GT2 spec, while the number 4 car was running GT1. According to reports, the number 3 car had a recessed or removed front end splitter, and the front fender louvers were covered on both right and left sides. The under body cover seemed to be less wide and there was not rear diffuser. The wing was lower than the number 4 car, only about 6 inches above the rear deck with no rise in the middle of the wing. Members, We thought you would like to be informed on how 2009 Corvette production is proceeding. 9,230 Corvettes have been produced so far in the 2009 production year. 362 ZR1s have been produced with a total of 509 in the ordering system. Of the 1,696 Convertible Corvettes produced, 9.7% have been built with the new for 2009 1LT Package. 40% of all ZR1s have been built in the new Cyber Gray color. 20% of all ZR1s have been Black. 17% of all ZR1s have been Jetstream Blue. Cyber Gray has been painted on 20% of all Corvettes, followed by Black at 20% and Victory Red at 14%. Effective November 1st, Eugene (Gene) Stefanyshyn - GM’s Global Rear Wheel Drive Vehicle Line Executive, is new VLE for Corvette. Gene's duties include Corvette, Sky, Solstice, Camaro, XLR, and Pontiac G8. Gene is based at GM Holden, Australia... Were he currently resides in Victoria. Gene Stefanyshyn’s background includes stints at the Saab Technical Center in Sweden, and at Opel’s International Technical Development Center, which he says was helpful with regard to working with his international colleagues on the Epsilon variants. He was vehicle line executive (VLE) overseeing the North American "Epsilon" platform models including the 2004 Malibu sedan and Malibu Maxx. The C5/C6 Registry congratulates Gene on his new position. The C5/C6 Registry has just learned CONGRATULATIONS are in order for Tom Wallace and Karla Berger. Tom and Karla were married today in Las Vegas, NV. We all wish and Karla a long and happy life together, and hope to see them at many more C5/C6 Registry events! Members, Let us be the first to Congratulate Corvette’s Chief Engineer and Vehicle Line Executive, Tom Wallace, on a magnificent career at General Motors! 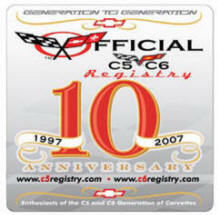 Tom has always been a fantastic friend of the Official C5/C6 Registry and its members. His leadership of Corvette over the last few years has been outstanding! Having a “Racer” at the helm of our beloved Sports Car has certainly shown through with the recent introduction of the 2009 ZR1 as a true American made Race Car…we mean, “Gentleman’s Corvette”! Tom shared with us some time ago that he has always been committed to Corvette and its lifestyle, and being promoted to Chief Engineer of Corvette was certainly a dream come true! From all of us at the Official C5/C6 Registry, A BIG C5/C6 THANK YOU goes out for the difference you have made in Corvette and the exciting Corvette’s you have brought us! Tom Wallace was born in Pittsburgh, PA. 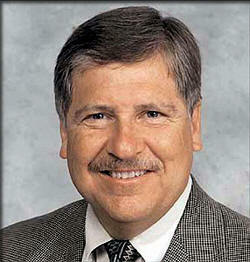 He began his GM career as a cooperative student with Buick Motor Division in 1970. He held several engineering positions focusing on engine technology and played a key role in the development of the turbocharged Buick Grand National coupes of the early '80s. Wallace most recently was vehicle line executive for Small/Midsize Trucks. After competing in amateur drag racing and gymkhana, Wallace started road racing with the Sports Car Club of America more than 30 years ago. He has competed in a variety of sedan and GT classes with raced-prepared Oldsmobile, Buick and Chevrolet models. He raced professionally in the International Motor Sports Association (IMSA) American Challenge series in 1978-79 in several endurance races, including the Sebring 12-hour and Daytona 24-hour events. Wallace now races regularly in the Detroit area and has twice won the GT1 championship at Waterford Hills Raceway. He has competed in the SCCA National Championship Runoffs six times. His sons, Brian, 36, and Tom, 39, are avid road racers who also have competed the SCCA Runoffs. New ZR1's added to Spring Mountain's Fleet! Spring Mountain took delivery of its first ZR1 Corvette for the Ron Fellows Performance Driving School last week. We are proud to have been chosen as one of only two authorized training facilities in the country to offer specialized driving programs to new Corvette ZR1 owners. Each new ZR1 owner receives a FREE 2-day driving school, compliments of Chevrolet. Registration for the ZR1 school has now begun, with classes starting on October 20 and filling fast. Call 800-391-6891, ext 238 and ask for Melinda to register for school today. 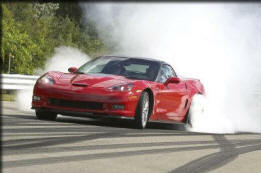 Book a ZR1 school before December 15 to take advantage of some extra incentives. Ron Fellows Driving School at Spring Mountain! Members, Here is the latest news that we have learned from GM Powertrain. According to GM, this filter was designed with the following in mind: “With the addition of piston oil cooling nozzles and other unique lubrication system requirements, a new design dual-rotor oil pump is required for the LS9 application. The new design oil pump produces greater volume and higher system oil pressure. To meet those requirements, a new oil filter with higher BURST strength is required. The UltraguardTM Gold UPF48R filter (U is for Ultra and R is for Racing) is black in color, has a thicker exterior shell and can be identified as GM part number 12626224. The internal components are the same in both the UPF48R and the PF48 oil filters. The UPF48R can be used in applications where the PF48 is specified. GM requires the UPF48R for the LS9 application and is also used for the LS7 application as both engines are built at GM’s Wixom Engine Performance Build Center. Members, Tell your friends that you can use this new UltraguardTM Gold UPF48R filter (part number 12626224) with all 2007, 2008 and 2009 C6 Corvettes that stipulate the use of GM’s PF48 oil filter, if you desire this new higher burst strength racing design. CORVETTE ZR1 GOES TO PARIS! The 2008 Paris Auto Show is underway, and the production version of the ZR1 is there! We want to thank our friends from the CORVETTE Club of France for these photos of this awesome machine at the Paris Auto Show! CLICK HERE FOR The Photos. Corvette Racing will aim for a sixth victory in the GT1 class in the 2009 24 Hours of Le Mans before entering the GT2 category in the second half of the American Le Mans Series 2009 season. 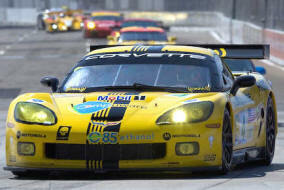 Corvette Racing will launch a full-season assault in the restructured GT division in 2010. "Corvette Racing will be well positioned for the future of production-based sports car racing worldwide with the plans we are announcing today," said Steve Wesoloski, GM Racing Road Racing Group manager. "The international regulations are converging around a single, global GT class, and we intend to continue Corvette's motorsports heritage by racing against manufacturers and marques that Corvette competes with in the marketplace. "The GT1 class has been a platform for GM Racing and our partners to develop the most technically sophisticated race cars in our history," Wesoloski said. "We intend to apply the tremendous success we have had in the GT1 category to make the next-generation Corvette C6.R a strong contender in the new GT class." "In accordance with the regulations, the new version of the Corvette C6.R race car will be available to independent teams," Wesoloski said. "Corvette and Chevrolet are global brands, and we look forward to seeing production-based Corvette race cars competing in series around the world under the leadership of the Automobile Club de l'Ouest (ACO) and the Fédération Internationale de l'Automobile (FIA)." The new GT Corvette C6.R race car will be based on the production Corvette's chassis and body design. 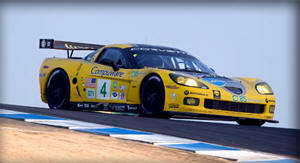 A 6.0-liter version of the LS7.R small-block V-8 will power the Corvette GT2 entry in the transitional 2009 season. A new naturally aspirated 5.5-liter version of the production GM small-block V-8 will be developed to meet the new GT regulations that will take effect in 2010. The chassis and powertrain specifications of the new Corvette GT entry will be submitted to the ACO and FIA for homologation approval. "Competing in GT2 will be a true test of our team's determination, talent and technology," said Doug Fehan, Corvette Racing program manager. "The level of competition in the category is already fierce, and that promises to become more intense with more manufacturers and top-tier teams. We've explored alternative paths, and we believe that competing in GT is the right road for Corvette Racing to take in the future. SIRIUS Satellite Radio (NASDAQ: SIRI) and XM Satellite Radio today announced that they have completed their merger, resulting in the nation’s premier radio company. The new company plans to change its corporate name to Sirius XM Radio Inc. The combined company’s stock will continue to be traded on the Nasdaq Global Select Market under the symbol “SIRI”. SIRIUS XM Radio broadcasts more than 300 channels of programming, including exclusive radio offerings from Howard Stern, Oprah, Opie & Anthony and Martha Stewart, among others. SIRIUS XM Radio will offer these expanded options to consumers through arrangements with the world’s leading automakers and its relationships with nationwide retailers. As a result of the merger, SIRIUS XM Radio will also be able to offer consumers new packages in audio entertainment, including the first-ever a la carte programming option in subscription media. In addition to two a la carte options, the new packages will include: “Best of Both,” giving subscribers the option to access certain programming from the other network; discounted Family Friendly packages; and tailored packages including “Mostly Music” and “News, Talk and Sports.” The first of the new packages will be available in the early Fall. “One of the most exciting benefits of this transaction is the ability to offer subscribers the option of expanding their subscriptions to include the Best of Both services. Given the respective popularity of exclusive programming on both SIRIUS and XM, we expect many subscribers will upgrade their current subscription,” said Karmazin. “The upside potential for both consumers and shareholders is huge. Consumers have the ease of adding premier programming without purchasing a new device. The corporate headquarters will be located in New York, NY and XM Satellite Radio, the company’s wholly-owned subsidiary, will remain headquartered in Washington, DC. The Corvette ZR1 has a top speed of 330 km/h (205 mph), making it the fastest Corvette ever produced and ranking it among the global super cars of commensurate performance. A favorable power-to-weight ratio gives the ZR1 an advantage over the competition. "The ZR1 is an incredible car by any measure," said Marc Comeau, vice president of sales, service and marketing for GM of Canada. "There's simply no other vehicle in the world that does a better job of balancing performance, fuel economy and the entire value equation." Under the carbon-fiber hood, a new LS9 6.2L supercharged small-block engine powers the ZR1. Heavy-duty and lightweight reciprocating components support high-rpm performance, while a new, sixth-generation Roots-type supercharger and complementing charge-cooling system (reduces inlet air temperature for maximum performance) help the LS9 make big power and torque across the rpm range. The engine is hand-assembled at GM's Performance Build Center, in Wixom, Mich. In addition to the engine, the ZR1 is a technology powerhouse, designed with lightweight and unique components that reinforce its performance with a confident feel on either a highway or road course. Together, these elements enable the ZR1 to deliver super car performance while also achieving fuel economy levels that competitors can’t match. (estimated fuel consumption 15.6 L/100km city and 10.2 L/100km highway). The standard ZR1 comes with content based on the Z06, including lightweight seats and other lightweight components. The available uplevel interior package includes power-adjustable, heated and leather-trimmed sport seats (embroidered with the ZR1 logo); side air bags; Bose premium audio system; navigation system; Bluetooth connectivity; power telescoping steering column; custom leather-wrapped interior available in four colors and more. Chrome wheels are the only other available option on the ZR1. Members, Here some really HOT News and information. 2008 Production Breakdown, and VIN Numbers. For the 2008 Indy Pace Car Here's what we know to date for the 500 Indy Pace Cars. Members, the final production numbers are now online in the members only section. No Interest Financing on CORVETTE ! Here is the latest tire news from Michelin for replacement Run-Flats for your C5 and C6. Now ultimate performance is within your grasp. Michelin is proud to announce that the same Michelin Pilot Sport PS2 ZP (Zero Pressure Technology) tires that come standard on the ZR1 have been custom-tuned for your Corvette C5, C6 or C6 Z06. Start your engines. The green flag drops on August 1, 2008. Give our dedicated Corvette tire representative Tom O’Grady at Direct Performance a call at 800-938-3456 ext.1879 or email him at togrady@discounttireco.com for all the details on this new and exciting Corvette replacement Run-Flat tire offering from Michelin. You can reach Tom Monday through Friday from 6:00 am to 4:00 pm ARIZONA time. 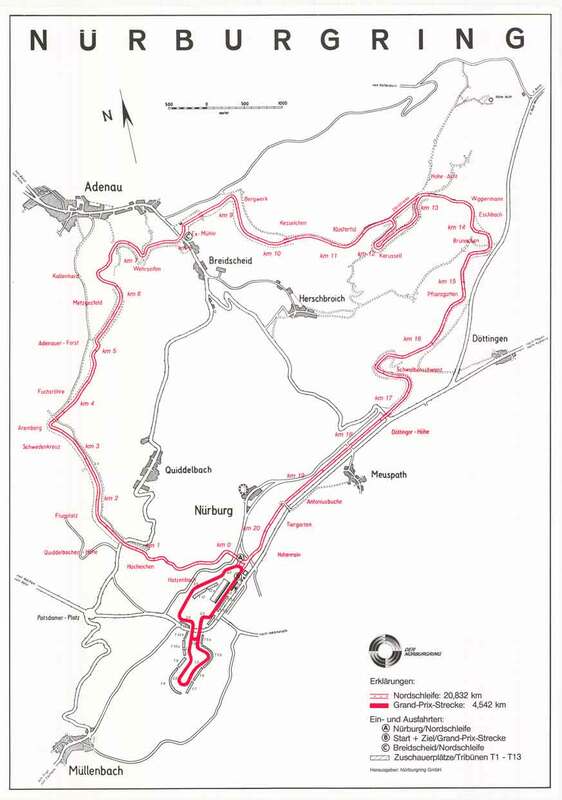 Most car enthusiasts are quite familiar with the  Nürburgring. Built in the 1920’s near Cologne, Germany, "the Ring" is considered to be the toughest and most challenging race track in the world. Over the last two weeks, we have been doing our final tuning and testing there before we start ZR1 production cars. This morning (Friday June 27), General Motors development engineer Jim Mero drove the Corvette ZR1 around the Nürburgring in a time of 7:26.4. Jim commented after the lap that conditions were good except for a strong headwind down the main straight and that the lap was solid, but he felt there were a few places he could have gone faster. The car was bone stock with the exception of the communications and safety equipment. The tires were production Michelin Pilot Sport 2’s. These tires have been developed specifically for the ZR1 and will have impressive wet traction and wear (tread wear rating = 220), in addition to excellent dry road holding. Chassis alignment and vehicle height were set to factory specs. Likewise, the engine calibrations were absolutely stock, emissions compliant and the car ran on pump (not racing) fuel. The vehicle was exactly like the cars that will be built in  Bowling Green, Kentucky and sold around the world later this summer. Despite posting one of the fastest times ever run by a production car, Nürburgring lap times were not an over-riding priority in the development of the ZR1. The truth is, if the only priority was speed at the ring, the car would not be very pleasant to drive on American roads. The ZR1 is an incredibly capable track machine, but unlike most ultra-high performance cars, it is very easy to live with on a daily basis. The timed lap was run with a rolling start, a departure from our previous practice of standing starts. This is more aligned with current industry practice. The lap was electronically timed and confirmed with two hand-held stopwatches. An in-car video will be posted when the engineering team returns from Germany. Look for it the week of July 7! ZR1 BY THE NUMBERS ! CLICK HERE FOR FULL PRESS RELEASE ! History was made on May 25, 2008 at the 92nd running of the Indianapolis 500 when a pair of distinctive yet highly differentiated Corvette models served as the Official Pace Cars - one highlighting Chevrolet's commitment to fuel solutions and the other marking 30 years of Corvette's Pace Car heritage. The Corvette Z06 E85 concept runs on E85 ethanol fuel and was driven by two-time Indianapolis 500 Champion Emerson Fittipaldi for the starting pace lap. The 30th Anniversary Corvette Pace Car Coupe (honoring the 1978 model - the first Corvette to pace the field at the Indy 500) paced all remaining laps up to 250, followed by the Convertible Indy which paced laps 251 to the end of the race. These Convertibles were used in many photographs and were seen on various television shows highlighting the race. Members – For those of you who had the opportunity to attend the Official C5/C6 Registry Bash on April 24-26 at the NCM, you had the opportunity to learn about the 2009 model year enhancements for the upcoming Corvettes. But member emails keep coming in on “What’s Up for 2009”? New Exterior Colors include Blade Silver and Cyber Gray. Steering Wheel audio controls will now be standard on all models. Bluetooth phone connection included with 2LT interior packages and above. New C6 Corvette emblems with a bright surround. Bosch will be the supplier for the ABS, traction control, active handling hardware and brake related software as an overhaul of the 2009 Corvette brake system takes place. The Convertible C6 model will now include a 1LT Package added to the line up. This will allow Corvette to now have a Convertible at a reduced cost over the 2008 model year prices. The new Forged Chrome Wheels which became available in late 2008 and standard on the Indy Pace Corvettes will continue to be available. The Z06 will receive its own very unique Z06 sill plates. 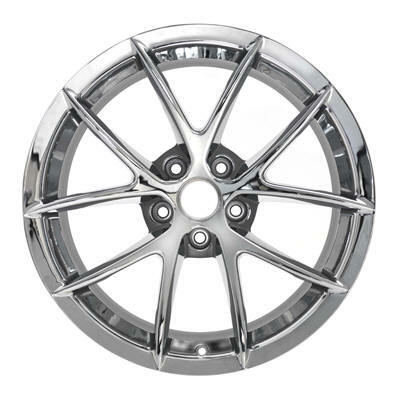 The original design Z06 wheel in Chrome (Q76) will be available at least one more year. The development of the ZR1 has carried over to the Z06 in that its dry sump oil tank will increase in size from 8 quarts to 11.5 quarts. Z06 interiors have new added colors as mentioned above. The acoustic package and power hatch pull down will now be standard on all Z06s. The Z06s Ebony base seats, which are currently stitched in red, will be changed to a gray stitch. Designer Kirk Bennion brought to the show his latest creation for Z06; they are the outstanding newly designed Spider Wheels. They will be available in Silver, Competition Gray or Chrome. 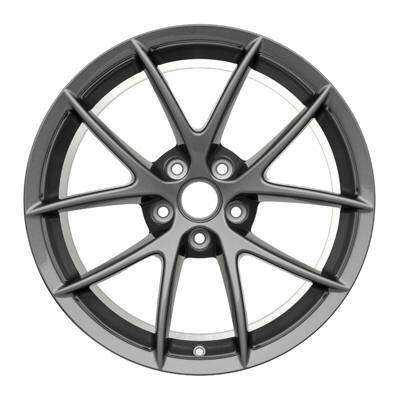 New Spider design Z06 wheel - Competition Gray. Members – Does the term “IT’S A RENTAL, DON’T BE GENTLE” mean anything to you? Well, it certainly will be to Hertz starting in June when they release to the renting public 500 very limited and specially equipped Velocity Yellow 2LT 2008 Coupes with an easily recognizable ZHZ fender badge on both sides. These very special Corvettes will be rented through the Hertz Fun Club Program at various Hertz locations throughout the United States, including Hawaii. This wonderful Hertz program has been ongoing for the last several years. They received considerable attention two years ago with the re-introduction of the Carroll Shelby Black and Gold Mustang GT-H that they have been successfully renting, just like they did back in 1966. Hertz’s soon to be collectible ZHZ Corvette Coupe will include the 2LT Ebony interior (193) package with a ZHZ embroidered logo on the console arm rest and floor mats inside of a Velocity Yellow (45U) exterior tint coat paint with a Black Stripe, from front to back, laid down the center of this C6. The transmission of choice will be the Six Speed Paddle Shift Automatic, along with the (NPP) Dual Mode Exhaust and (F55) Magnetic Select Ride Control, including the cross drilled rotors. Genuine Corvette Accessories will play a big part in the uniqueness of this Corvette. Hertz is including the (VPL) GCA Ultimate Appearance Package which includes the screen mesh package (side coves, exhaust plate screen, grille mesh), body-color rear license plate frame, underhood blanket and lamp kit, graphics package (as mentioned above), full-width spoiler and body-color door handles. The wheels for this very unique ZHZ will be the Seven-Spoke Forged-Chrome Wheel which certainly will add a dramatic appearance to this already exciting ride. Members, the best news of all is that Hertz will be offering a very special discount program to Registry Members. We have placed this discount code in our MEMBERS ONLY section today and it will also be listed in the upcoming Spring 2008 Official C5/C6 Registry Magazine headed to your mailbox in June. MEMBERS, PLEASE LOG ON TO THE MEMBERS ONLY HOT NEWS SECTION FOR THE HERTZ REGISTRY DISCOUNT CODES. These codes will allow for a weekend discount or a week long discount. We finalized with Hertz www.Hertz.com the list of cities that these Fun Club Corvettes will be available at. Please note the cities below and we hope you will coordinate them with your future travel plans. Miami, Orlando, Ft. Lauderdale, Tampa, Palm Beach, Fort Meyers, Dallas, Houston, Boston, San Diego, Las Vegas, Los Angeles, Seattle, Portland, San Francisco, Oahu, Maui, Nashville, Charlotte, Charleston, Philadelphia, Dulles, Phoenix, Denver and Newark. Indications are that this program will possibly run for a two-year period with 2009 C6s being brought into service early next year. Rumors seem to be confirming that they will add Convertibles as part of next year’s program. We know this program will be a hit with our traveling Registry members! At the powertrain meeting this morning at the 2008 Birthday Bash at the NCM, GM announced the final, tested and official power numbers for the ZR1's LS9 Engine. Johnny O'Connell celebrated the 30th victory of his American Le Mans Series career with an exuberant burnout that filled the streets of Long Beach with tire smoke. O'Connell and Jan Magnussen teamed up in their No. 3 Compuware Corvette C6.R to score a 1.374-second victory in the GT1 division over Oliver Gavin and Olivier Beretta in the No. 4 Compuware Corvette C6.R. 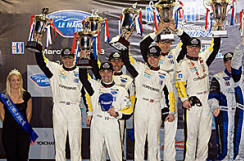 O'Connell became the third driver in ALMS history to score 30 wins, and today's victory propelled O'Connell and Magnussen to a four-point lead (66-62) in the drivers championship. Click Here For More ! Mr.Y2000, You Are My Last Hope! Q:<?/x-tad-smaller><?/smaller><?/color><?/fontfamily><?fontfamily><?param ITC Slimbach><?smaller><?x-tad-smaller> I have been a member since August 1998 and have owned several Corvettes over the years. I purchased my Torch Red Z06 in January 2003. I drive my Corvette as much as possible, as I live in east Tennessee near the Smokey Mountains. I’m fortunate that I live in an area where one can truly enjoy their Corvette to its fullest potential. In January 2005, at about 30,000 miles, I started having an INTERMITTENT ‘failure to crank’ problem. My solution, when this occurs, has been to just hold the key over with the clutch in, and finally after 15-30 seconds (which seems like an eternity) for no apparent reason, it begins to crank and start. It is like the system is on a timer! CLICK HERE FOR MORE ! Corvette Racing made motorsports history today, scoring the first victory with E85R ethanol racing fuel in American Le Mans Series competition. On a sultry, sunny day, Oliver Gavin and Olivier Beretta sailed to their second consecutive class victory on the waterfront street circuit in St. Petersburg, Fla. The reigning champions won the GT1 division in the Acura Sports Car Challenge of St. Petersburg with a 4.754-second margin of victory in their No. 4 Compuware Corvette C6.R over Johnny O'Connell and Jan Magnussen in the No. 3 Compuware Corvette C6.R. 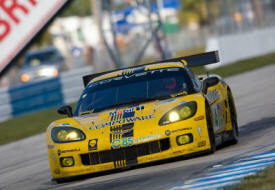 CORVETTE RACING SCORES SIXTH SEBRING 12-HOUR GT1 VICTORY. O'Connell Notches Record-Setting Seventh Sebring Class Win with Magnussen and Fellows. America's classic endurance race, the Mobil 1 Twelve Hours of Sebring. Johnny O'Connell, Jan Magnussen and Ron Fellows drove their No. 3 Compuware Corvette C6.R to an eight-lap victory over their teammates Oliver Gavin, Olivier Beretta and Max Papis in the No. 4 Compuware Corvette C6.R. Johnny O'Connell became the all-time leader in Sebring victories with his seventh career win on the historic circuit. His victory tonight broke a longstanding tie with motorsports legend Phil Hill, who tallied six victories on the Sebring course. Congratulations Johnny! "We introduced two new cars at this event, and again demonstrated the hallmarks of Corvette Racing: meticulous preparation, great teamwork, and flawless pit stops," said Corvette Racing program manager Doug Fehan. "We've shown that we're ready for an exciting season in ALMS and we're looking forward to Le Mans." Indy Champion visits CORVETTE Assembly Plant! Emerson Fittipaldi, two-time Indy 500 winner and Chevy’s 2008 Indy 500 pace car driver, visited Bowling Green Assembly on Tuesday, March 11. Emerson autographed the center consoles of the Indy 500 Pace Car replicas and then enjoyed a tour of the plant and museum. 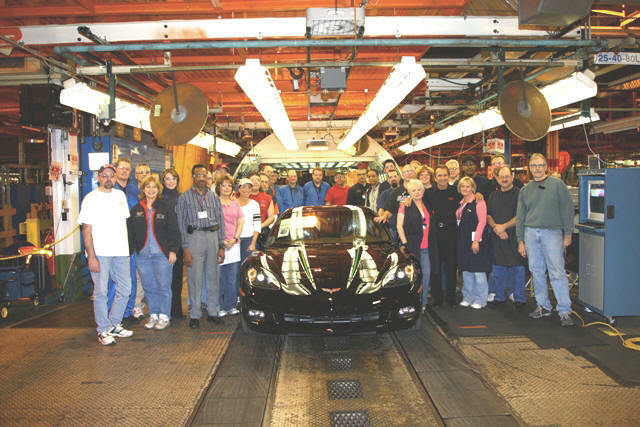 Below, you can see Emerson and a pace car replica at the end of the assembly line with a group of proud Bowling Green employees. The Indy Pace Coupe above, Production # 003 belongs to Director Jake. May 21st: Final Allocation Available - The day when dealers will know how many 2009 Corvettes they are allocated to order. 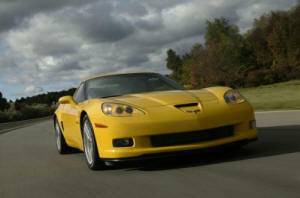 May 22nd: Initial DOSP Cycle Begins - The first day dealers have to begin ordering 2009 Corvettes and Z06's (not ZR1's). 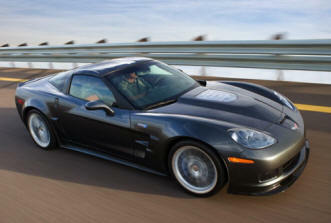 May 29th: Initial DOSP Cycle Begins for ZR1 - The first day dealers have to begin ordering 2009 Corvette ZR1s. June 23rd: Plant Startup Date - The first day the Bowling Green, KY plant will begin producing 2009 Corvettes and Corvette Z06's. 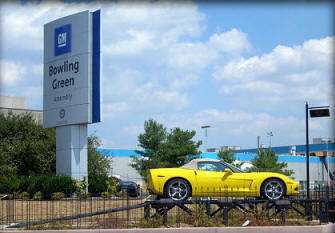 July 14th: ZR1 Startup Date - The first day the Bowling Green, KY plant will begin producing 2009 Corvette ZR1's. Wil Cooksey Receives Very Special Award. The Council of Engineering Deans of the Historically Black Colleges and Universities will recognize GM Corvette plant manager Wilmer Cooksey with its Lifetime Service award for his longtime dedication to education for African Americans. The group will present the prestigious award to Cooksey, a former college professor, on Saturday, Feb. 16 during the Black Engineer of the Year Award program in Baltimore. "Many people leave the workplace for academia, but Wil did the opposite: he brought his advanced academic knowledge to the shop floor," said Gary Cowger, GM group vice president of Global Manufacturing and Labor Relations, who will speak about Cooksey 's achievements during the award ceremony. "We are grateful for the leadership he has brought to GM manufacturing, and we're proud of his lifetime commitment to education." The award was created especially for Cooksey, who was an assistant professor in industrial engineering at General Motors Institute in Flint, Mich. before taking his first job GM manufacturing job in 1976. Cooksey held leadership positions at GM plants in St. Louis, Atlanta and Fairfax, Kan. before being named plant manager of GM's only Chevy Corvette plant in Bowling Green, Ky. in 1993. Under Cooksey's direction, the Corvette and the plant have won numerous awards. Cooksey, who has called running the Corvette plant his "dream job," announced his retirement effective March 1. Cooksey serves on the Tennessee State University Foundation Board of Trustees, the Western Kentucky University School of Business Advisory Board, the Western Kentucky University College of Education and Behavioral Science, Drug Abuse Resistance Education Advisory Council and the Advancing Minorities' Interest in Engineering (AMIE) Board of Directors. A native of Fort Worth, Texas, Cooksey earned a bachelor's degree in electrical engineering from Tennessee State University in 1965 and a master's degree in industrial engineering from the University of Toledo in 1972. He completed postgraduate work in mechanical engineering at Michigan State University. 427 Limited Edition Z06 - Signed by Wil Cooksey ! Chevrolet announced the 2008 Corvette 427 Limited Edition Z06, a limited-production model that pays homage to the big-block Stingray models of the mid-1960s. The 427 designation refers to the cubic-inch displacement for the highest-performance engines offered between 1966 and ’69 – and is also the cubic-inch equivalent of the Z06’s 7.0L LS7 small-block V-8. The 427 Limited Edition Z06 features a Crystal Red Tintcoat exterior, the first Z06 ever offered with a red metallic tintcoat paint. It also features graphics on the hood and fascia that evoke the style of the famed “stinger” hood design and graphics that were offered with 1967 models equipped with the 427 engine. Also unique to this model are “427” hood badges. Each example is numbered and signed by Wil Cooksey, the Corvette assembly plant manager who is retiring after 15 years on the job, and comes with a certificate of authenticity. MORE INFO ON THE MIGHT LS9 - with a CTS-V Sideline. We've had the info on the LS9 from the start ( Click Here ), but here's some new information. It was just learned that the LSA engine, a detuned ( 515-525 HP ) version of the LS9 that will power the 2009 Cadillac CTS-V will be built using normal production methods, in a conventional engine plant. However, the LS9 that is to power the CORVETTE ZR1 will be built by hand in the GM Performance Build Center in Wixom, Michigan. The HOT new CTS-V, internally code named "GMX322 V S/C", will start production in September of 2008 and will be limited to 7000 units annually, Both manual and automatic transmissions are expected with a possible, and optional paddle shift. The new CTS-V will feature a completely re-done rear end, with an improved rear axle that our sources say has eliminated wheel hop. SCOTTSDALE, Ariz. - January 20, 2008 - A new generation of muscle cars took center stage last night when American automakers Ford, General Motors and Chrysler sold their latest performance vehicles at No Reserve and raised nearly $2 million for charities at the 37th Annual Barrett-Jackson Collector Car Event in Scottsdale, Ariz. The 2008 Ford Shelby GT500KR sold for $550,000, the 2009 Chevrolet Corvette ZR1 for $1 million and 2008 Dodge Challenger for $400,000. The Challenger was purchased by Barrett-Jackson CEO/Chairman Craig Jackson, with all proceeds benefiting the Phoenix-based charity Not My Kid, Inc.
"The great American muscle cars are back," said Jackson. "During the 1960s and early '70s, Detroit demonstrated its stronghold on automotive performance and power with cars like these. We're thrilled that Barrett-Jackson provided the stage for the rebirth of these amazing vehicles. When the new Challenger crossed the block, we decided it was a great opportunity for the Barrett-Jackson team to jump in and show our support for Not My Kid, a deserving local charity." 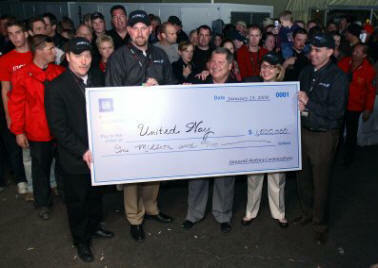 Each manufacturer donated money from the sale of the cars to a designated charity. Ford donated the proceeds of the GT500KR to the Juvenile Diabetes Research Foundation; GM donated a portion of the proceeds of the Corvette ZR1's winning bid to United Way; and the proceeds from the new Challenger were donated to Not My Kid, Inc. 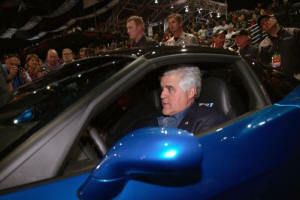 Among the stars present last night was "Tonight Show" host and avid car collector Jay Leno, who drove the Corvette ZR1 across the block. Automotive icon Carroll Shelby addressed the crowd during the sale of the GT500KR, along with "Grey's Anatomy" star Patrick Dempsey. Click Here for movie, photos and details. ZR1 and BARRETT JACKSON History IN THE MAKING. MEMBERS: If your ever wanted to own a one of one kind factory special built Corvette, a 2009 ZR1 being auctioned off at the Barrett Jackson auction in Phoenix on January 19th this coming Saturday night will be the one to have. Chevrolet is auctioning this very special ZR1 off with all proceeds going to the United Way. The lucky bidder will be able to be present in Bowling Green when this one of one ZR1 is built. This ZR1 is loaded with the 4LZ package, and will be a factory produced Lemans Blue color, with the choice of Dark Titanium or Ebony interior, chrome or painted wheels, the winners choice. The VIN Number of this special ZR1 will end in 5900001, the only ZR1 with the "9" designation in the VIN. 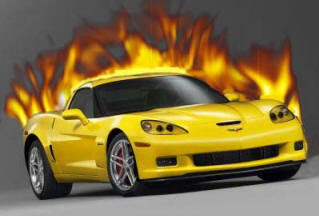 The production ZR1's will be be in the 58 range, Chevrolet is keeping 5800001 so you will have a very unique CORVETTE. The buyer will receive a build book and factory documentation related to this very unique, one of one ZR1. As a bonus on the factory build documentation, you will find the RPO Code "BD1" ( Blue Devil One ) This will be the only Corvette to ever have this RPO "BD1" code ! Saturday night, the Jet Stream blue ZR1 you will see on the stage is for representation only, the winners car will not be built until the third quarter of this year. Bid High the United Way will thank you! Ed Peper announces the championship-winning Corvette Racing team will use E85 ethanol. Chevrolet announced the championship-winning Corvette Racing team will use E85 ethanol fuel in the upcoming American Le Mans Series, and the ALMS announces it will be the first motorsports series to incorporate "green racing" into its 2008 racing season, at the 2008 North American International Auto Show Tuesday, January 15, 2008 in Detroit, Michigan. "Since its inception, Corvette has always been a platform for Chevrolet and GM to introduce and develop new technology," Chevrolet general manager Ed Peper said during today's announcement at the North American International Auto Show. "Like the Corvette Z06 E85 concept car that will pace the 2008 Indianapolis 500, the use of E85 ethanol fuel by America's premier production sports car racing team in a high-profile, high-tech racing series like the ALMS shows that Chevy is continuing to lead by example. MORE INFO ON THE NEW CORVETTE ZR1 SUPERCAR! 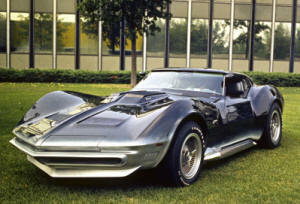 On December 20th GM announced to the world the existence of the new "Super Car" from GM, the ZR1. As usual, the C5/C6 Registry was right there with a fact and photo filled section on the Registry website. Today, we've added to, and enhanced the website with a breakdown section of the site on then powerful new LS9 engine that powers the ZR1 and a walk around video featuring the ZR1 and Harlan Charles. Harlan Charles is the Corvette Production Manager, but he's also a GM executive that listens to the wishes, wants, rants and raves of Corvette enthusiasts. Harlan's relationship with the Corvette community and the Registry has helped bring about cars like the Ron Fellows Z06, the 07 and 08 Indy Pace cars, the ZR1 and a much more. Thanks Harlan, we appreciate you! 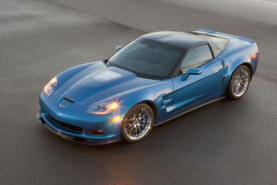 CLICK HERE for the ZR1 / LS9 information and Harlan's video. 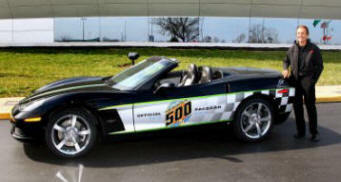 CORVETTE "INDY" PACE CAR FOR 2008 IS HERE! History will be made at the 2008 Indianapolis 500 when a pair of distinctive yet highly differentiated Corvette models will serve as the official pace cars ­ one highlighting Chevrolet's commitment to fuel solutions and the other marking 30 years of Corvette's pace car heritage. The Corvette Z06 E85 concept (left) runs on E85 ethanol fuel and will be driven during the race's pace lap by two-time Indianapolis 500 champion Emerson Fittipaldi. The Corvette 30th Anniversary Pace Car honors the 1978 model - the first Corvette to pace the field at the Indy 500. CLICK HERE For Photos and Official Press Release.